We've been doing nationwide public records research for businesses since 2003. 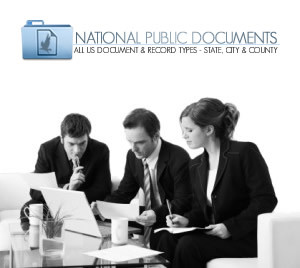 National Public Documents is the same people and resources now providing this service to consumers. We make it easy so you can save valuable time and money. We also guarantee we will find & deliver your document or there is no cost. National Public Records is a research and retrieval company that provides documents needed by consumers and small businesses. Since 2003 we have been servicing the real estate, finance and legal industry. Continued consumer and small business inquiries led us to expand our operations to also accommodate consumers and small businesses. Getting public documents is often difficult, slow and expensive. We make it fast and easy for you to get public records at a good price from anywhere in the country. National Public Records is your one stop document retrieval shop. We make it easy so you can save valuable time and money. We also guarantee we will find & deliver your document or there is no cost. Years were spent building the resources for us to obtain documents in any US county. Public records are available to anyone but how to get them varies by county. Most documents require someone going to the county to search the records. Many counties make documents available online for a fee but you also have to know how to search. All have fees that vary by county and could include subscription fees, a cost for each inquiry, copy charges & delivery charges. Go to the order form and fill in the required information. This will provide us what we need to get what you are looking for. The price of your request will appear for approval before any payment is processed. Once payment is approved your order will appear in our system and the search will begin. You can contact us for any questions at any time. We will also contact you if we have any questions. Once we obtain your document it will be sent to you by the method chosen when you ordered. Online counties go back only so many years. What then? Some types of documents are not even available online. Other sites have missing documents. Many require software to search and view their documents. How do you find someone you can pay and trust to go to the county for you? That’s where we come in. You will save time and money. We take all the work and uncertainty out of getting the public document you need. We guarantee to find and deliver your document or there is no cost!